Robin Iori has a passion for strategizing and communicating on behalf of her clients. Talking with the media about her clients is one of her strongest skills. Robin had planned to be a journalist. She worked at a couple of newspapers before she decided to pursue a communications career. Her early work in journalism has served her well. She knows how to find the “hook” needed to interest reporters in a potential story, and her media contacts are global. She excels in writing and editing. Today, she prepares ghost blogs, articles, scripts, newsletters, and all types of written pieces for her clients. 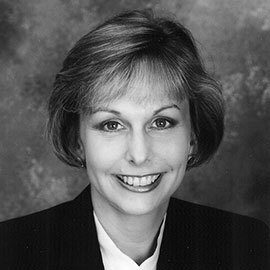 In the early 1990s, Robin was recruited to serve as the first marketing director for Gibson Dunn & Crutcher, a large West Coast-based law firm. Starting from scratch, she created the firm’s first proposal development operation, wrote most of its marketing materials and handled media relations internationally for its 20 offices. She received two “Your Honor” awards from the Legal Marketing Association for her work there. She has since continued to create award-winning marketing brochures for clients in various industries. After leaving Gibson Dunn, Robin opened her own communications firm in Los Angeles, focusing on financial, legal and accounting firms. Now working out of Chicago, Robin continues to work firms in her initial client base and has added clients in several new industries, including construction, real estate and recruiting. Her client list has included Debevoise & Plimpton, White & Case, Arthur Andersen, Leonard Green & Partners, Orrick Herrington & Sutcliffe, Dickinson Wright, Polsinelli Shughart, Bodman and several other well-known firms. During the past decade, she has added the creation of website content to her list of service areas. She has written websites for law firms, medical professionals, educational consultants, construction companies and other professionals. Robin is active in several professional organizations. She is on the board of the Professional Women’s Club of Chicago (PWCC) and has served as a mentor for the Step Up Women’s Network. She also assists the Justinian Society with marketing counsel to Chicago lawyers and has spoken on marketing and media relations to several organizations, including the Chicago chapter of the Illinois Attorney-Mediator Forum and the Legal Marketing Association. Robin also serves on a committee for Almost Home Kids (AHK) in Chicago. AHK serves medically complex and technology dependent children in Illinois.